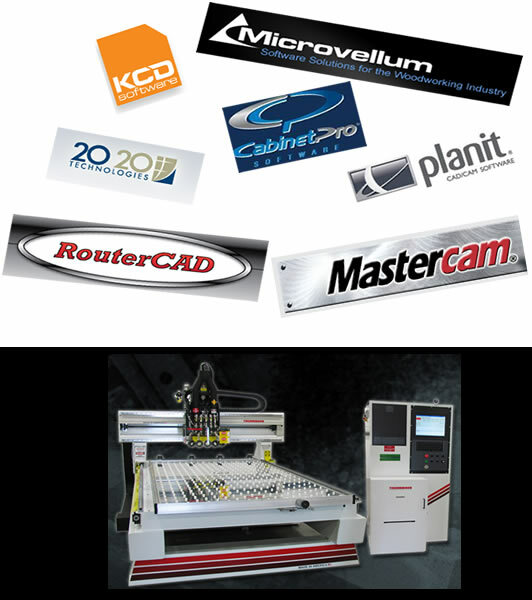 Did you know that Thermwood CNC Routers are compatible with most major design and CAD/CAM software programs? This means that you don't have to worry about changing software when you use a Thermwood CNC Router. You can output machine code from software like KCD, Microvellum, 20-20, Planit, MasterCam and many others to a Thermwood CNC Router. CAD/CAM programs like Mastercam are used for a variety of applications because the CAD portion allows you to design virtually anything in two and three dimensions. The CAM portion converts the design to useable machine code for a CNC machine. CAD products such as Autocad with no CAM can be sent to a Thermwood CNC Router by changing the layer names and sending the .dxf file to the Thermwood controller. Design programs like KCD, Cabinetvision and others are mainly used in Nested Based applications for the cabinet, closet, RV, Marine and other industries that utilize sheet products. Please click here for more detailed information on these connections. Please click here to Request a Consultation with one of our CNC Experts. They can evaluate your production needs to determine how you can reduce costs and increase efficiency.